Hello curlyteas! Welcome to the brand new forum. With the exception of a few VIP areas, this forum is FREE to use and to post. Sign up for free today. 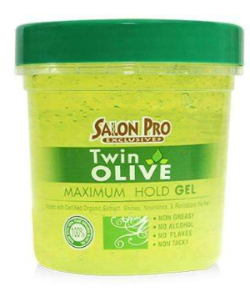 A couple of your fellow curlyteas asked me earlier if I'd ever used Salon Pro Exclusives Twin Olive Maximum Hold Gel (they were looking for an alternative to EcoStyler gels). One of them asked if I had the ingredients list because they couldn't find it. Well, I finally found the list and I'm just going to post it for those who may have had trouble at first too. Aqua (Water), Polysorbate 20, Carbomer, Aminomethyl Propanol, Glycerin, PVP, Polyaminopropyl Biguanide, Phenoxyethanol, Tocopheryl Acetate (Vitamin E), Olea Europaea (Olive) Fruit Oil, Aloe Barbadensis Leaf Juice, Panthenol, Citric Acid, Tetrasodium EDTA, VP/VA Copolymer, Polyacrylic Acid, Potassium Sorbate, Sodium Benzoate, Methoxycinnamidopropyl Hydroxysultaine, Propylparaben, Methylparaben, Blue No. 1 Aluminum Lake (CI 42090), Acid Yellow #23 (CI 19140), Fragrance (Parfum), Benzyl Benzoate, Benzyl Alcohol, Linalool. Just skimming through the ingredients list, here's some things I noticed. PVP (Polyvinylpyrrolidone) - film forming polymer; gives it "hold"
I also noticed there's more carbomer, preservative, and Vitamin E in this gel than Olive oil. Carbomer is usually used at 0.1-0.5%. So... um... yeah. Unless they're using a ton of carbomer in this mix, it's quite possible that not a lot of olive oil is in this gel. I noticed it's not paraben free. There's Propylparaben and Methylparaben in it. By the way, Propylparaben has a 7 ("high hazard") on the EWG.org scale. Methylparaben gets a 4. These ingredients are used as preservatives, but some companies are taking them out because they may cause endocrine disruption. This is not the best ingredients list I've ever seen (by far). But you may want to test how it works in your hair. In case you wanted to know, my store-bought gel of choice is the Wet Line Xtreme gel (with the lime green top). It is not a natural gel either. Water, Carbomer, Triethanolamine, Polyacrylate Acid, Glycerin, Fragrance, Phenylcarbinol, Methylchloroisothiazolinone, Methylisothiazolinone, Panthenol, Aloe Vera Extract, Tetrasodium EDTA, Colorant FD&C Violet 2.